We did it… we finally played Wroxham! Although we have to wait another two weeks for the away leg originally scheduled for November. Grays took the lead in the 7th minute with a stunning strike from David East. Stepping in at right back to cover for the injured Craig Pope, he collected the ball on the right thirty yards from goal before cutting inside a defender and firing left footed in to the top left hand corner of the net. Wroxham came close to levelling in the 10th minute as they countered a Grays corner and Jamie Forshaw drove to the corner of the area but fired narrowly over the bar. 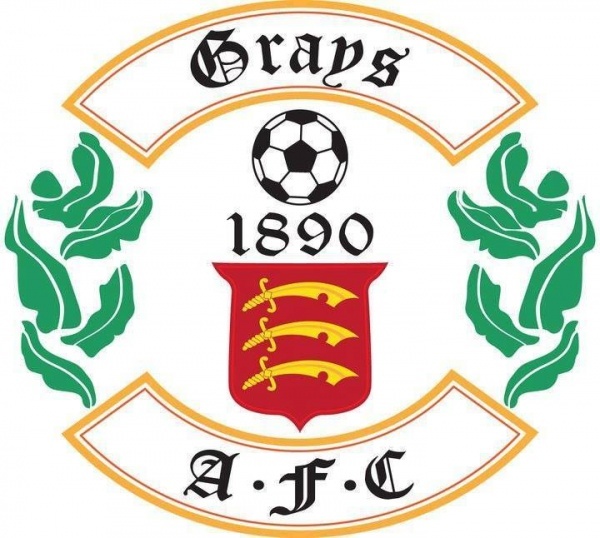 That miss proved costly as Grays doubled their lead just three minutes later. The ball was played through to Danny Bunce in the Wroxham area and he weaved his way across the edge of the area before firing towards goal with his right foot. The shot fell perfectly into the path of Jack West and he diverted the ball into the corner of the net. Grays came close to extending their lead in the 24th minute as a long kick out by Lamar Johnson was flicked on by Danny Bunce into the path of Jeff Hammond. He attacked into the area and fired towards goal but Jake Jessup was off his line quickly to smother the shot. The home side were forced into an early substitution just after the half hour mark as Jeff Hammond was replaced by Joe Sweeney. Grays grabbed a deserved third goal in the 38th minute as Leon Lalite crossed the ball from the right to the back of the area. Lee Flynn came in from the left and volleyed with the outside of his left foot into the far corner of the net. Grays almost had a fourth just a minute later as Jack West was played through on goal but his shot was saved by Jake Jessup. Wroxham came close in the 41st minute to getting a goal back. A corner from the right was headed to the back post where Jamie Forshaw was left in space but he fired over the bar from close range. Grays came close to extending their lead in the final few seconds of the half as Danny Bunce was played in down the left by Jared Small. His cross from the edge of the area was towards the back post but narrowly eluded Joe Sweeney who would have had a simple tap in. The home side did finally get their fourth goal just six minutes into the second half. A defence splitting pass through the middle found Jack West in on goal and he made no mistake as he fired first time into the top left hand corner of the net. Wroxham almost grabbed a consolation goal in the 55th minute as a strike from the edge of the area was parried by Lamar Johnson but he recovered well to close down the rebound and block the shot for a corner. Grays were in cruise control by the hour mark with Danny Bunce collecting the ball on the left, doing kick ups all the way into the Wroxham area before Jake Jessup eventually claimed the ball as Danny Bunce was preparing to shoot. In the 64th minute, Worxham had their best chance as Lamar Johnson came out to the edge of the area to claim a high ball but fumbled on the way down leaving substitute Matthew Blake with an open goal to aim at. His shot was on target, but there is a reason Grays have only conceded 24 goals this season, and Jared Small covered well to get back and clear off the line. Jack West had a chance to complete his hat-trick in the 76th minute as he worked his way through on goal but his shot was well saved by Jake Jessup. Grays made a double change with ten minutes remaining, replacing Danny Bunce and Jared Small with Joao Carlos and Daniel Subuola. The home side comfortably saw out the remaining few minutes to record their eleventh win in twelve games and keep the pressure up on Maldon & Tiptree at the top of the table.